Two behemoths define Ogden’s historic 25th Street. Union Station commands the west end of downtown, while the Ben Lomond Historic Suites and Hotel anchors the eastern end of the street. The grand dame of Utah hotels, the Ben Lomond defines Ogden’s skyline and offers panoramic views from its upper floors. Michael Fenton is fascinated by his hometown’s history. A North Ogden native, the hotel’s animated director of sales enjoys attracting guests who want to experience yesteryear luxury. He also engagingly tells stories of the property’s evolution through more than a century of trading hands. A passionate researcher, Michael has gathered anecdotes about the hotel’s past both from local residents and former hotel employees. With the arrival of the transcontinental railroad, Ogden’s raison de etre changed from being a small agricultural town to becoming a necessary nexus of rail commerce and travel. Booming with business and pride, the city’s motto rightfully proclaimed that, “You can’t get anywhere without coming to Ogden!” “If you were anyone at the time,” Michael explains, “you had to come to Ogden.” Teddy Roosevelt, he relates, made an Ogden appearance in 1903. Of course, passengers needed lodging, and in 1891, two aspiring hoteliers built the five-story Reed Hotel where the Ben Lomond now stands. A.P. Bigelow’s Ogden State (or Bigelow) Bank occupied the ground floor of the Reed. 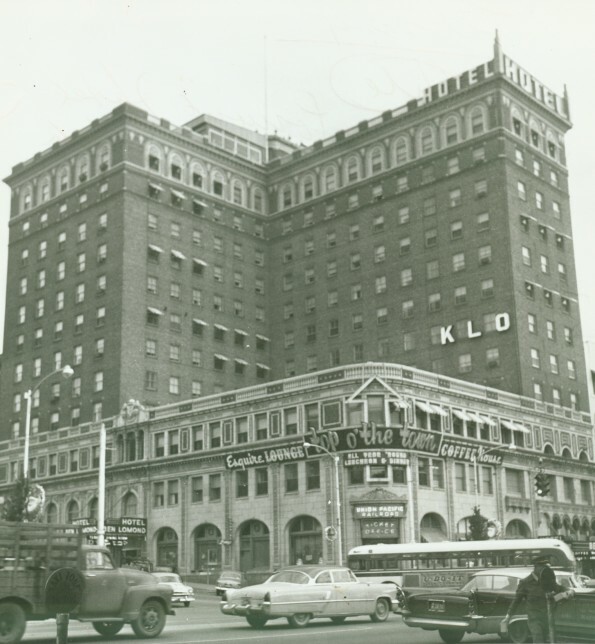 “Bigelow saw Ogden as the major player in the western half of the US,” Michael says, and so, with a 300-strong stockholders group, bought the Reed and erected the Bigelow Hotel, an edifice that trumpeted Ogdenites’ sophistication. The Bigelow’s Italian Renaissance Revival splendor reflected the community’s early 20th-century wealth. Opulence permeated every aspect of the hotel’s design, details and materials, such as in the Shakespeare Room–one of five elaborate private themed dining rooms–decorated with murals painted by Utah artist LeConte Stewart, or the ornate Florentine palace-style ballroom. Atop the hotel was a private two-story penthouse. The full-service hotel was the center of Ogden society and business. “Everything happened here,” Michael notes, including the 1928 Democratic National Convention. Bigelow’s bank failed in the 1929 stock market crash, and he sold the hotel to Marriner Eccles in 1933. Financially devastated, Bigelow moved to California, where he died penniless. From his repertoire of narratives, Michael shares that during this time when black celebrities such as Louis Armstrong and Jackie Robinson were denied lodging in Salt Lake City, they were welcomed at the Ben Lomond. In another anecdote, he tells of a woman who baked for the hotel during the Depression. The understanding hotel management allowed her to take baked goods across the railyard to the itinerant poor. Others also depended on the Ben Lomond’s generosity. Michael’s father-in-law was a hotel bellhop in the 50s, and said that the bell room was the only place in the hotel from which you could surreptitiously order hootch on a Sunday. Then came the 80s and ‘renovations,’ a word which, when interpreted by historic preservationists, means perverted by modern, bottom-line aesthetic. Michael was told that dynamiting the reinforced concrete in the process of altering the structure to create condos, “literally blew out windows all the way across the street to the park.” In the remodel, some original integrity was lost. However most of the hotel’s visible grandeur–the original 1927 brass and crystal chandeliers in the ballroom, the complex and ornate ceiling detailing, the marble floors–remain as a testament to the structure’s early architectural pageantry. In response to the US financial crisis, subsequent private investors had to bail out of their not-profitable venture; but the recession may have actually saved the hotel. Unable to financially benefit from selling the property, the current silent investors continue to bankroll hotel operations.